Yesterday I made the ravioli stuffed with pumpkin. As is my habit, I went to buy vegetables at a farm not so far from my house, which sells its products directly to retail, and I noticed they had some beautiful pumpkins. So once I got home I summoned up with goodwill and patience and I became active. Since preparing Ravioli is really a slog, for the sake of convenience I make more than needed and freeze them. Then, when needed I directly dip them into boiling water. If you would like to freeze them too, you should make them freeze on a tray first and only after they are frozen you can collect them in a bag. Clean the pumpkin and weigh it when it's raw, put in a saucepan a drizzle of olive oil and the minced onion, make it heat up and add the pumpkin cutted into little cubic pieces, salt, pepper, cover and cook over low heat. Once it's cooked squash it with a fork and let it cool up, then add all others stuffing ingredients and mix everything (picture 1). Prepare the egg pasta: Put the flour on a pastry board and make a well, then break the eggs in the middle and put a pinch of salt (picture2). Strongly knead the mixture by mashing it well with the palm of the hands, if it is too hard add a little of hot water. 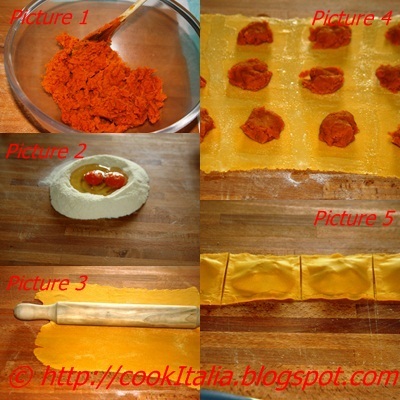 Clue and let stand for half hour, cut it in half and, using a rolling pin or an appropriate machine, roll it out until you obtain two thin pasta sheets (picture3). Put on one of the pasta sheet half a tablespoon of stuffing at gaps of up to 5 cm between them, brush the pasta with water among one pile and the other forming squares (picture 4), cover with the other pasta sheet and using a pasta cutter(mine is broken so I used the smooth one, that is usually used for the pizza ... can you see the difference? ), cut and bind them well with your fingertips (picture 5). Cook in plenty of lightly salted water with a drizzle of oil so that they won't stick together, stirring them gently. Meanwhile in a saucepan melt the butter with sage. Once the ravioli are cooked drain them by using a skimmer and place them in the pan with butter and sage, season and serve into dish sprinkled with grated Grana cheese. P.s. You can also serve this ravioli with tomato sauce and some basil leaves or with a good ragout.